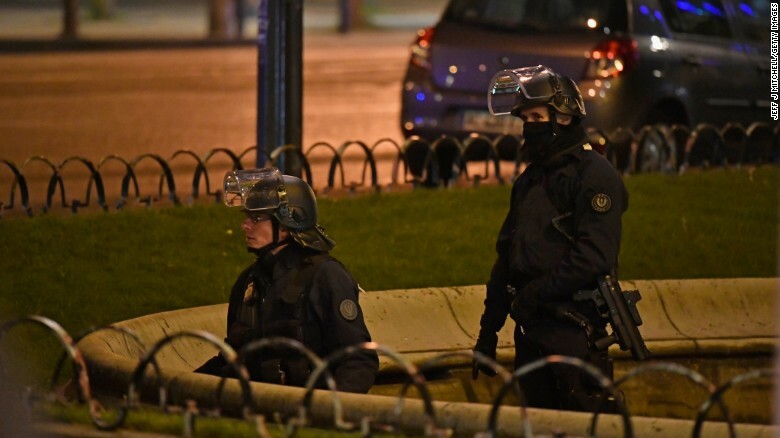 Paris (CNN) In a country riven by increasing divisions, Thursday&apos;s shooting on Paris&apos; Champs Elysees, which left one police officer dead, has the potential to upend an already contentious and unpredictable election. With a record number of voters still undecided, analysts say the shooting, by a suspect said to be known to French security services for radical Islamist activities, could play into the narrative pushed by the far-right. "This recasts the final hours of the campaign, puts law and order and fighting terrorism, immigration and national identity at the heart. It makes it much more of a battle between Marine Le Pen and those who oppose her," said CNN&apos;s Melissa Bell. Far-right candidate Marine Le Pen&apos;s Front National party has made immigration and the perceived threat of Islam a central plank in her campaign. As news of the shooting broke, Le Pen was taking part in live televised debate with 10 other candidates. She immediately responded by saying security in the country was failing its citizens. "Not everything has been done to protect our citizens. What we need is the resources to make sure we can combat the Islamist terrorism. I don&apos;t want our youth to get used to living with this danger. Naivety is over," she said. Candidates have just one day before French law brings an end to campaigning ahead of the first round of voting Sunday. Three candidates -- Le Pen, Center-right candidate Francois Fillon and centrist independent, Emmanuel Macron -- announced they were suspending their campaigns. Fillon said he wanted to show "solidarity" with the police, who appear to be the prime targets in the attack. Along with one officer shot and killed, two others were wounded. Macron also announced he would cancel rallies in Rouen and Arras to free up security forces who would need to be mobilized "to ensure the safety of our citizens," he said in a statement. The suggestion that the suspect, a French national, was already under surveillance by security services is expected to provide grist for politicians who look to criticize the government&apos;s commitment to protecting its citizens. A source close to the investigation told CNN the suspect was "Fiches S," or "S card," indicating that he was regarded as a potential threat to national security. In 2016, authorities were monitoring 15,000 people who they believed were in the process of radicalization. Earlier, French officials said 10,000 people were on their Fiche S list. "If he was indeed he was a Fiche S... it&apos;s going to bring out some cries from they public and some politicians as well, about why, if he was under surveillance, and if the police knew about this person, why he could possibly have pulled this off tonight with a semiautomatic weapon while he was free," CNN&apos;s Paris bureau chief Jim Bitterman said. CNN&apos;s Paris correspondent Melissa Bell said the suspect was Fiches S pays into Le Pen&apos;s rhetoric. Le Pen has said: "We need to expel the foreign imams who preach the hate and fundamentalism of foreign Fiches S."
"Whether this could tip the election is to be seen," Bell said. Security expert Glenn Schoen told CNN that Thursday&apos;s attack could have greater implications beyond the French vote. "We now have elections coming up on 8 June in the United Kingdom and in September in Germany. Even this smaller incident, in comparison to some of the ones before, is going to have a fairly large impact," he said. It is not the first terror-related incident to mar the French election cycle, and prior attacks in the country -- from the 2015 Paris attacks to last year&apos;s Bastille Day attack in Nice -- are to the forefront of many voter&apos;s minds. Following the arrests this week of two men suspected of preparing an "imminent violent attack" in Marseilles, Some 50,000 policemen and soldiers will be deployed for the two election rounds, French Interior Minister Matthias Fekl said. Whether many voters will be discouraged from turning out to vote in the face of another potential attack remains to be seen, but the logistics of policing polling stations across France remains daunting. Although there are 50,000 police on the streets, CNN&apos;s Bitterman points out, there are 60,000 polling stations. "You can&apos;t provide complete protection," he said. Voters in France go to the polls on Sunday in the first round of the presidential elections. The top two vote-getters from a crowded field will go head-to-head in the second round on May 7. Published on Fri, 21 Apr 2017 06:25:49 GMT, © All rights reserved by the publisher.